Living room organization is a challenge because the living room (or family room) has so many functions. You’re supposed to use the same space to relax, entertain, play, eat, and possibly exercise? 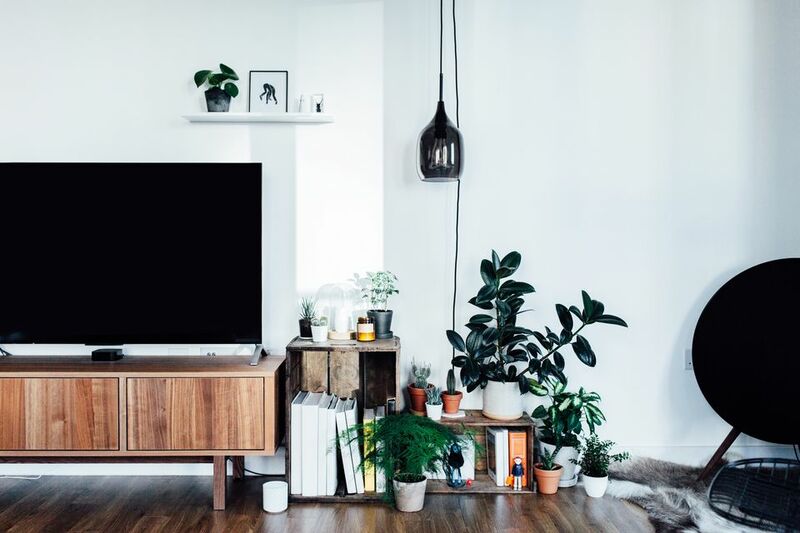 Given how many things they’re used for, it’s no wonder living rooms often end up full of clutter. Walking into any living room and you may see piles of mail, unread magazines, toys scattered about and exercise equipment. Here’s how to quickly organize this entire space in half an hour. Grab a basket or a bin and walk around the room. Pick up anything that doesn’t belong in your living room and is contributing to an obvious state of messiness and put it in the basket. Return items that belong in another room to their storage spaces, then return living room items to their proper storage spaces. Pillows that have landed on the floor can go back on the couch, boots can go back by the front door or in the closet, and so on. Also, take this time to throw out those dying flowers in the vase on the mantel, or any other trash you find. If you come across something that belongs in the living room but has no proper place, create one. So, if there are several remote controls scattered about the room, pick a convenient spot to gather them every time. The coffee table, the TV stand, it doesn’t matter exactly where, as long as the location works for you. What matters is from now on, the remotes will have a consistent home. Likewise, make sure that books, magazines and throw pillows have a home so they create piles of clutter.If you process your mail in the living room, have a container or file folder for that task handy. 3. Declutter the "Disaster Zone"
Most rooms have a corner, or a piece of furniture, that functions as the designated disaster zone even when most of the room is pretty well organized. If you have any major centers of clutter in your living room, like a certain end table that gets loaded up with random stray items, neaten it now. It will make the entire room look cleaner. A very simple step in the organization of any room that takes no money, no products, and almost no time, is to simply straighten everything out and line it up. This is called “facing”. This goes for smaller items like books on your bookshelf, knick-knacks over the fireplace, and blankets folded on top of a chest, as well as chairs and tables. When everything’s askew it can make a room look far messier than it actually is, and when your space looks out of control you can start to feel that way too. But though it might sound obvious, just quickly straightening everything from the pencils on your desk to the throw pillows on the sofa can make a major impact. Is there anything about being in the room that always bugs you, any action that always feels inconvenient? For instance, maybe every time you sit in the living room and watch TV, you remember something you need to buy at the drugstore and have to go into the kitchen to write it on your shopping list or risk forgetting it forever. Fix this now by getting a pad and pen and placing them on the coffee table, within easy reach. If the problem is something you can’t fix now, make a note to fix it at another time. You might spot some issues like this while you’re organizing–maybe stacking up your magazines made you see that a magazine rack would be a convenient addition to the room. Or perhaps you realized that having a recycling bin for newspapers, or a basket for cat toys, would help keep your living room organized in the long term. Take a few minutes now to make future organizing plans. Now that you’ve decluttered, faced and straightened up your living room,it’s a good moment to pick something (an old broken chair you’re never going to have time to repair? A throw rug that wasn’t your style in the first place?) and get rid of it. Let it go and free up some living room space. If you have children, a good place to start is with their toys. Is there something they’re OK giving up? Ask them to help you pick out a few items to donate.